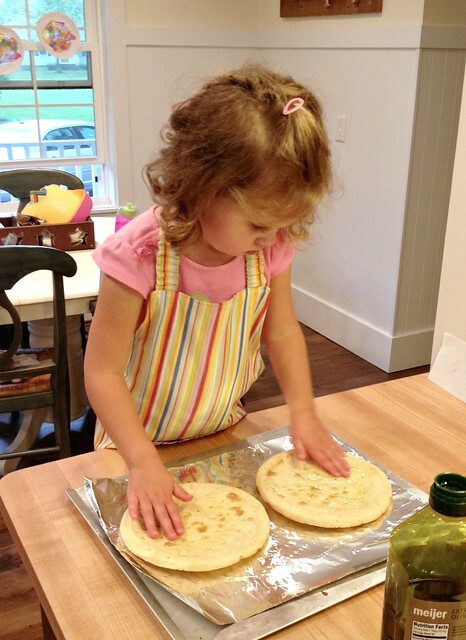 Since Nora enjoys cooking and helping out in the kitchen SO much, and since I know many of you have children who are eager to help in the kitchen as well, I figured it might be fun to start posting a few SUPER simple recipes that not only taste great, but are easy for little hands to help with. I’m going to call the series “Kids in the Kitchen” and I’ll eventually create a little logo for it in my sidebar. In the mean time, you can follow all future Kids in the Kitchen posts via this link. 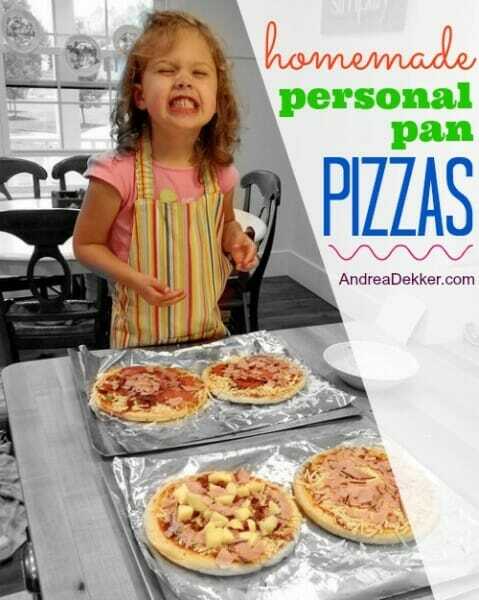 Today’s recipe for Homemade Personal Pan Pizzas could not be more perfect for little hands… plus, most kids I know will eat pizza (especially if they get to choose their own toppings). Nora had been begging me to “make her own pizza” for a couple weeks already, so when I saw these little personal pan size crusts on sale at the grocery store, I snatched a few of them up — knowing we had gobs of pizza toppings at home! I honestly didn’t think the crusts would taste great, I just liked how small they were. But surprisingly, they were amazing — even reheated as leftovers in the toaster oven the next day! I will definitely be buying these little crusts again. 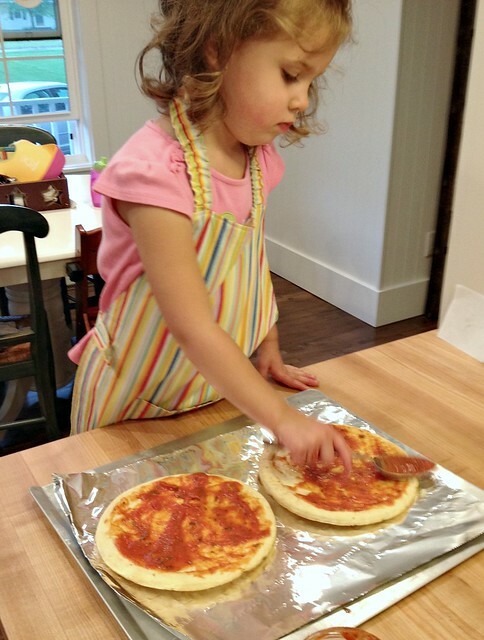 Anyway, Nora had SOOOOO much fun making her pizza and pizza for the whole family. She told everyone she saw for the next 48 hours that she made us pizza for dinner and how good it tasted. She also asked if we could make it again the following night — but I told her we’d probably wait at least another week or so. If you’re looking for a fun, simple, frugal, and really yummy meal to prepare with your toddlers and preschoolers, this recipe should satisfy! There are literally endless possibilities of pizzas you could make — and the beauty of making the personal pan size is that everyone can choose their favorite toppings. We made a ham, bacon, and cheese pizza for Nora and Simon to share. Nora made me a Hawaiian pizza with ham, bacon, cheese, and pineapple. 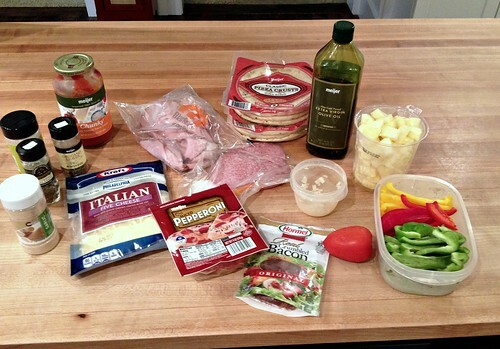 And we made 2 supreme pizzas with onions, peppers, tomatoes, salami, ham, bacon, pepperoni, etc. for Dave (and for leftovers). 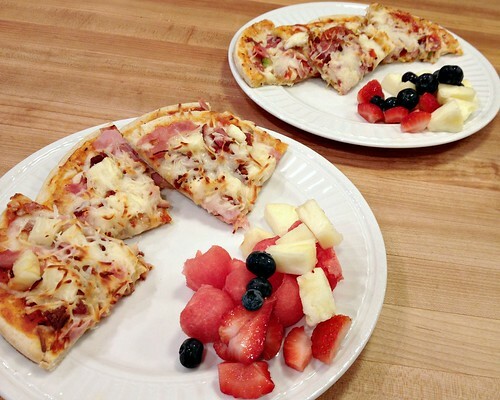 These pizzas were honestly WAY better than I thought they would be — and our whole family eagerly gobbled them up for dinner… and then as leftovers the next day for lunch. I will most definitely be stocking up on pizza crusts and adding this fun, family-friendly meal to our meal plan more often! 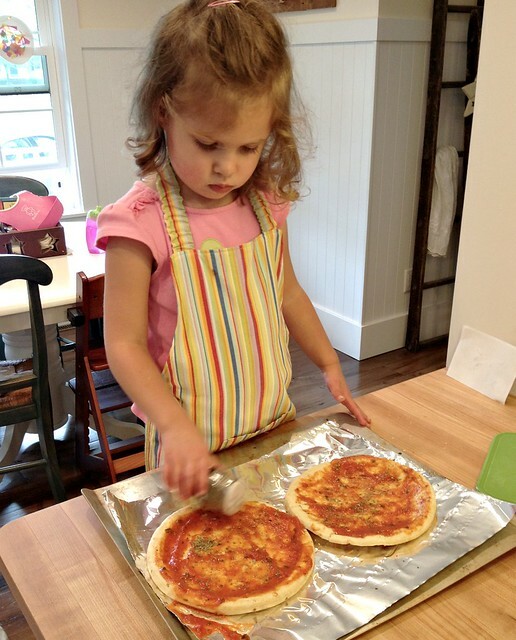 What are your favorite recipes to make with kids? Click here for more Kids in the Kitchen posts… or visit my virtual recipe box for more simple, delicious, family friendly recipes! We do pizza quite often with our 3yo. She loves it, especially as she can help by cutting mushrooms and pineapple. Then she gets to pick which toppings. We tend to insist on 1 vege (and know she’ll have pineapple), but she gets to pick which vege. I tend to use a scone dough for the crust as so easy to whip up, and can make her an individual sized one. Sounds yummy… and I’m impressed she can cut her own mushrooms and pineapple already!! Another crust is to use biscuit dough. It is fun for the kids to roll out and cheap! Personal pizzas are always fun to make! When I taught preschool, I used to have the kids make them like lions (sticking chow mein noodles around the edge) and melting the cheese on top. Although, eventually I discovered it was easier / better to use an English muffin, spread peanut butter on it and then do the chow mein noodles as the mane. I’m glad Nora had so much fun making – and eating – them. Like Simon, Nathan’s already a big fan of pizza! Anyway, looking forward to more of these recipes!! We do this, too, but with English muffins for crust! 8 minutes at 375 for those. I like doing these because they’re fun for kids, they’re super simple, and we can make them with anything we want. I always buy pizza sauce for the “easy” factor, but it might be fun to make my own and freeze a bunch of it eventually. Love this! I have a daughter who needs to eat gluten and dairy free so will stock up when I see these items on sale..wish they weren’t so expensive. 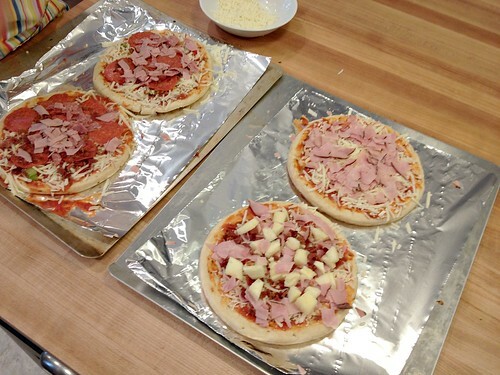 We love making individual pizzas too, and usually instead if these actual pizza crusts I buy a package of pita breads. 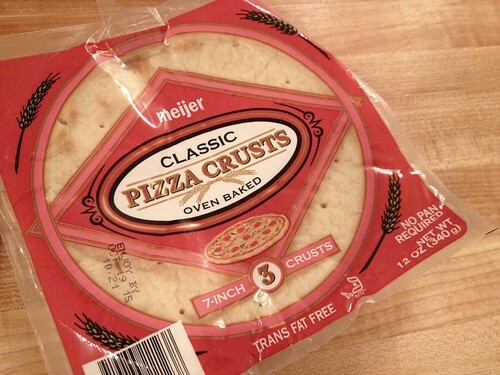 REALLY good, and they come in a pack of 6, and are less expensive for the 6 than for 3 pizza crusts. Oh! I just realized you said you need to buy gluten and dairy free and those are the expensive items! Sorry! :) Stocking up on those specialty items is definitely important when they’re on sale. Aww, she’s so proud of herself. That’s great that she loves to work and help out and you are encouraging that. Had to laugh…one of Emily’s BFFs is not allowed to stay for dinner b/c he is such a picky eater. We were getting pizza one night and he decided to stay…he was SO proud of himself for eating a slice! What 16-year-old boy does not like pizza?! Maybe I’ll pull this recipe out the next time he comes over, lol. haha! as a very NON-picky eater, I’ve always feared having super picky eating children. I realize that some of it can fall on the parents, but I’m convinced that most of a child’s pickiness is their own sensory “deal”. So they may or may not grow out of it. It does make it hard to go over to friend’s houses though. And yes, what boy (or anyone in general) doesn’t like pizza! My kids ate just about everything until they were about 3…then my son got pretty picky for a few years, but the food battle is not one I was willing to fight. Eat or be hungry. 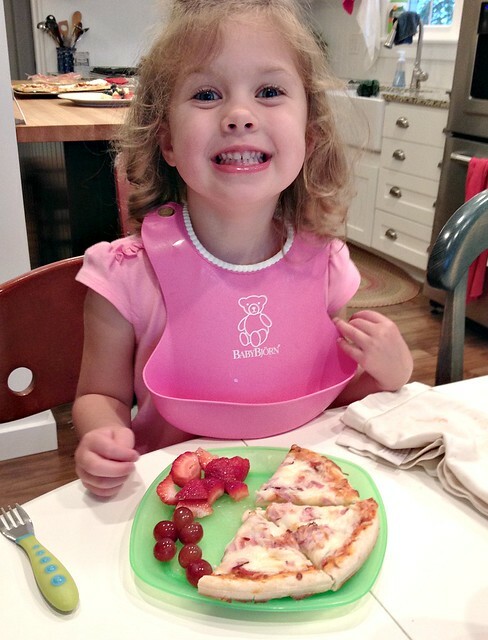 Now both kids eat just about anything I serve…they may not like it but they will eat it, thankfully! 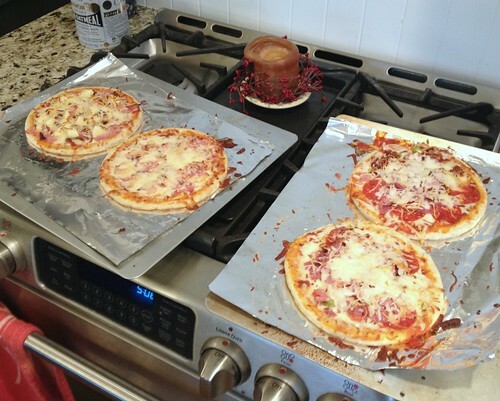 When you stock up on pizzas, how will you store them? well… probably just in my pantry next to the bread 🙂 The crusts are just in the grocery department and don’t need to be refrigerated. How fun! You can tell she really enjoys this. Great job for teaching her young! It will give her a lot of confidence in the kitchen. 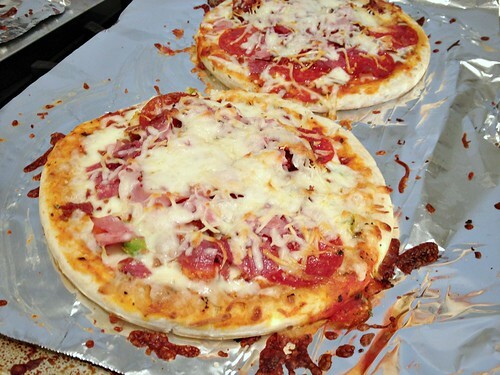 Our family favorite lately had been tortilla pizzas. 425 for 8-10 minutes. 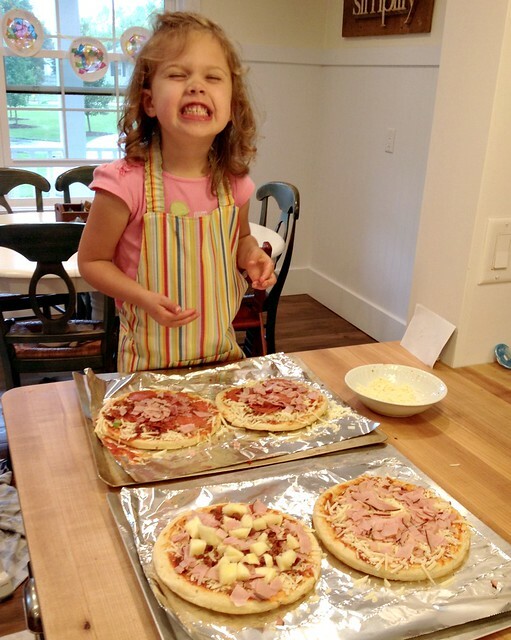 Pizza sauce, cheese, toppings–yum!